For centuries, people who were hard of hearing or deaf have relied on communicating with others through visual cues. As deaf communities grew, people began to standardize signs, building a rich vocabulary and grammar that exists independently of any other language. A casual observer of a conversation conducted in sign language might describe it as graceful, dramatic, frantic, comic or angry without knowing what a single sign meant. There are hundreds of sign languages. Wherever there are communities of deaf people, you'll find them communicating with a unique vocabulary and grammar. Even within a single country, you can encounter regional variations and dialects -- like any spoken language, you're bound to find people in different regions who communicate the same concept in different ways. It may seem strange to those who don't speak sign language, but countries that share a common spoken language do not necessarily share a common sign language. American Sign Language (ASL or Ameslan) and British Sign Language (BSL) evolved independently of one another, so it would be very difficult, or even impossible, for an American deaf person to communicate with an English deaf person. However, many of the signs in ASL were adapted from French Sign Language (LSF). So a speaker of ASL in France could potentially communicate clearly with deaf people there, even though the spoken languages are completely different. There is no direct correlation between natural sign languages and spoken languages -- speakers of sign language communicate through concepts, not words. While it is possible to interpret sign language into a spoken language such as English (and vice versa), such an interpretation would not be a direct translation. Most speakers of sign language find it difficult to learn it from books and static pictures. The way a speaker signs a concept can say more about his meaning than the sign itself. Pictures don't capture the nuances that are intrinsic for clear communication with sign language, and sometimes it is difficult to communicate the motions some signs require without video, animation or an in-person demonstration. In this article, we'll focus mainly on American Sign Language, the dominant sign language in the United States. We'll also look at Signed Exact English (SEE) and Pidgin Signed English (PSE), two alternatives to ASL that are used primarily between deaf people and hearing people. SEE and PSE rely on the English language to varying degrees. This means that unlike ASL, they are constructed, or artificial, sign languages. We'll talk about the attempt to establish a universal sign language and look at other applications of sign language. In the next section, we'll explore the history of American Sign Language. As mentioned in the previous section, French Sign Language is the origin for many of the signs used in ASL. In the early 1800s, a minister to the deaf named Thomas Hopkins Gallaudet traveled from America to Europe to learn teaching techniques. In England, he met Roch-Ambroise Cucurron, Abbé Sicard, the director of a school for the deaf in Paris. Gallaudet learned teaching methods and several signs to use in communication with the deaf and hard of hearing from Abbé Sicard. Gallaudet convinced Laurent Clerc, one of Sicard's students, to help establish a school for the deaf in America. Gallaudet and Clerc established the American School for the Deaf (ASD) in 1817 in Hartford, Connecticut. The school combined signs from LSF with those that had been in use by the Deaf community in America to create a standardized language. In time, this language evolved into ASL, now considered one of the most comprehensive sign languages in the world. Today, the ASD campus includes elementary, junior high and high schools. Thomas Gallaudet's son, Edward, founded Gallaudet University in Washington, D.C. Gallaudet was the first college for deaf and hard of hearing students. The university offers degree programs in dozens of majors for more than 1,500 students. While most students are deaf or hard of hearing, up to 5 percent of an enrolling class may consist of hearing students. ASL is the official language on campus, though there is controversy among the Deaf community concerning the ASL skill level of the staff and faculty at the university, as well as the institution's perspective on the importance of ASL in general. Students of ASL do not need to learn speechreading or listening skills to become proficient. ASL has its own grammar, phonology (in spoken languages, phonology is the study of sounds; in sign language, it's the study of the basic hand signals and motions that provide the foundation of all signing), syntax and morphology (in spoken and written languages, morphology studies how words are formed from basic sounds and words; in sign language, it's the way basic hand signals and motions. represent concepts). ASL can be interpreted into any other language. It is not normally written, though there is a system called SignWriting designed to allow speakers of ASL to communicate signs and facial expressions in a written format without translating their thoughts into another language. Learning to read English can be difficult for some deaf people, because ASL and English are not structured the same way. English uses complex rules that aren't applicable to ASL. Not being able to hear the language can also be a major challenge in learning to read. While it is true that you don't have to vocalize when using sign language with someone else, most people still call the process of communicating through sign language "speaking." In this article, we'll use the terms speaking and signing interchangeably. If you are the listener in a sign language conversation, you receive signs. The person signing is the speaker, and the person watching is the receiver. When receiving, you should focus on the speaker's face and eyes, using your peripheral vision to watch hand signs. Much of the meaning in sign language comes across in facial expressions, and by focusing solely on the speaker's hands you'll likely misinterpret what the speaker is trying to communicate. American Sign Language is a visual language that incorporates gestures, facial expressions, head movements, body language and even the space around the speaker. Hand signs are the foundation of the language. Many signs are iconic, meaning the sign uses a visual image that resembles the concept it represents. For instance, to express the concept of "deer" in ASL, you would hold your hands up to either side of your head, fingers spread, to represent antlers. Actions are often expressed through hand signals that mimic the action being communicated -- if you wished to sign the concept "eat," you would bring your fingers and thumb of your dominant hand together as if holding food and then move your hand toward your mouth. The alphabet is an important series of signs. Some hand signs for letters resemble the written form of the respective letter. When you use the hand signs for letters to spell out a word, you are finger spelling. Finger spelling is useful to convey names or to ask someone the sign for a particular concept. ASL uses one-handed signals for each letter of the alphabet (some other sign languages use both hands for some letters). Many people find finger spelling the most challenging hurdle when learning to sign, as accomplished speakers are very fast finger spellers. To express an ongoing action, such as "thinking," you would make the sign for "think" twice in a row. Some signs in ASL can serve as either a noun or a verb, depending on how you sign them. In general, you'd sign a verb using larger hand gestures and a noun by using smaller gestures that are doubled. At times, this can cause confusion. The sign for "food" is the same as doubling the sign for "eat," yet the sign for "eating" is also a repeated "eat" sign. In these cases, the receiver usually knows what you mean by the context of your sentences or the size of your gestures. Almost any sign can be modified. Furrowing your eyebrows, tilting your head, puffing your cheeks or shifting your body are just a few ways that you can use to change the meaning of what you are saying. Any inflection that doesn't require your hands is called a nonmanual marker. An accomplished ASL speaker can convey a lot of information with only a few gestures coupled with nonmanual markers. Another way to modify signs, particularly action signs, is to alter the speed with which you make the sign or by directionalizing the sign. If you make the sign for "eat" very slowly, for example, you can communicate that you took your time while eating. To directionalize concepts, you orient signs in a particular direction to communicate a specific meaning. If you wanted to communicate the English phrase "I gave you a gift" to your receiver, you would make the sign "give" towards your receiver, followed by the sign for "gift." There is no need to make the signs for "I" or "you," because they were understood when you directionalized the sign. We'll look at the grammar of ASL next. ASL sentences use a topic comment structure. The topic of an ASL sentence is like the subject of a sentence in English. Using the object of your sentence as the topic is called topicalization. Often the topic of an ASL sentence is a pronoun, such as I, you, he or she. An ASL speaker may sign a subject pronoun at the beginning of a sentence, the end of a sentence or both. For instance, if you were to say "I am an employee" in ASL, you could sign "I employee," "employee I," or "I employee I." All three are grammatically correct in ASL. The comment section of an ASL sentence is similar to an English sentence's predicate - it says something about the topic. You might see a third element added to an ASL sentence structure to indicate the tense of the sentence. You would normally structure such a sentence as time topic comment. Depending on what you are trying to communicate and the style your receiver is used to seeing, you may alter the order of your signs for clarity. ASL grammar is not strict when it comes to sign order for time, topic and comment sections of a sentence, though many speakers feel that whatever order is least like English is the most appropriate. Expressing the time frame for the sentence at the end can be confusing -- most speakers avoid it. You only need to establish the tense at the beginning of a conversation. If you wanted to tell a long story about what you did yesterday, you would sign "yesterday" at the beginning of your first sentence and go from there. Once you have designated the tense, your receivers will know that everything you sign belongs in that time until you indicate a new tense. Tenses can vary depending on when a conversation takes place. In English you might say "I'm going to eat lunch at a restaurant this afternoon" or "Today I ate lunch at a restaurant." In ASL, you would sign "now afternoon I eat lunch" and your audience would understand the tense depending on the current time. If you were speaking with them in the morning, they would know you were talking about future plans. On the other hand, if you were talking at night, they would know you were speaking about what you did earlier that day. To talk about a series of events, ASL speakers can use the space in front of and behind them to indicate a timeline. Signs close to the body indicate events that happened recently or will happen soon, while signs further out indicate events that either happened long ago in the past or will happen further in the future. ASL does not use any variation of the verb "to be." Someone speaking ASL would not say, "I am hungry," for example -- they would sign "I hungry" while nodding. To say "I am not hungry," you would sign "I hungry" while shaking your head. In general, while signing a sentence you nod your head to affirm a condition and shake your head to negate it. The only time ASL speakers use "to be" verbs is when they are speaking about English (or any other comparable language). If you are speaking ASL and wish to indicate a particular person as the subject of your sentence, you can use indexing. To index, you point your index finger at a person who is present (the present referent) or you can indicate someone who is not there (an absent referent). To talk about someone not in the room, you would first sign that person's name, and then indicate a space in the area you are in to represent that person. From that moment on, when you point to that space, the person you are speaking to knows that you are talking about the person whose identity you've established earlier. You punctuate sentences in ASL through pauses and facial expressions. You can punctuate questions by signing a question mark, though most speakers rely on facial expressions to indicate they've asked a question. For example, to ask a receiver "do you like movies," a speaker would sign "you like movies" and raise his eyebrows. In the next section, we'll talk about some basic rules of etiquette when conversing in ASL. When you are receiving in an ASL conversation, you should wait for the speaker to finish signing and look at you to indicate it is now your turn to speak. At times a speaker will look away from their audience while thinking of the next sign. Looking away indicates that the speaker isn't finished yet and will continue in a moment. Sometimes a receiver will look away while someone else is signing and begin to sign back, effectively interrupting the speaker. Usually people in such a conversation have to be on good terms with one another, or such behavior can be offensive. Heated discussions and arguments often feature this tactic. ASL speakers will sometimes turn and sign to an imaginary person. They do this to signify a conversation they had or observed with someone else. It's the same concept as saying "he said/she said" when having a conversation in English. People with hearing who are learning sign language can sometimes get confused by this, since it looks like the speaker is suddenly talking to someone else, but as a receiver they should continue to pay attention to the speaker. According to Dr. Bill Vicars (president of a company that focuses on creating American Sign Language programs and learning experiences) it isn't rude to walk between two deaf people using sign language if you need to get by unless you hesitate or draw attention to yourself. It's best to walk through at a steady pace, which allows the speakers to continue their conversation with minimal interruption. 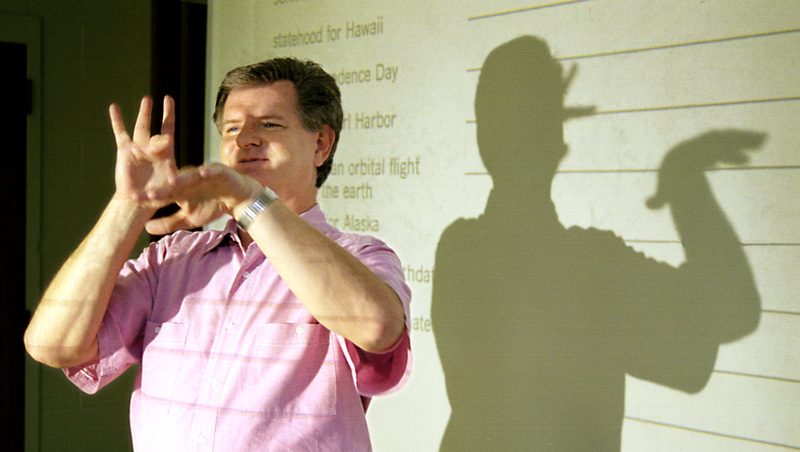 Some ASL speakers include signs invented for other sign languages. Other ASL speakers try to avoid using such signs, believing that it dilutes the language. Dr. Vicars describes two approaches to teaching ASL - the prescriptive approach and the descriptive approach. A teacher who tells his students not to use a particular sign is being prescriptive - he is teaching ASL according to his belief that the language must remain pure, without influence from other languages. A teacher who shows his students the signs currently used in the Deaf Community, whether they are part of the pure ASL vocabulary and grammar or not, uses the descriptive approach. In the United States, there are two other forms of sign language that have wide usage: Signed Exact English and Pidgin Signed English. Additionally, some Americans are also fluent in the International Sign Language vocabulary. Signed Exact English is a language that attempts to translate spoken English into a signed language. SEE includes prefixes, suffixes, tenses, words and sentence structures not found in ASL. SEE signers try to be very specific and literal, while ASL signers concern themselves with expressing concepts. An ASL signer can use the sign for "beautiful" to mean something is pretty, beautiful or lovely, but people signing in SEE will designate the specific meaning of the sign by signing the initial letter before moving on to the concept's sign. For example, a signer communicating the word "pretty" in SEE would first sign the letter "p" and then perform the ASL sign for "beautiful." Hearing teachers who interact with deaf or hard of hearing children often prefer SEE to ASL, mainly because SEE uses the same rules and facilitates the learning process for reading English. SEE instructors encourage students to use listening techniques and learn to speechread to make it easier to communicate and understand others. It takes an SEE signer longer to sign something than someone using ASL or PSE, because the SEE signer must include word endings, auxiliary verbs, et cetera. Some educators stress the concept of total communication, which includes sign language, gestures, fingerspelling, speechreading, speech, reading, writing and pictures. Pidgin Signed English uses a vocabulary pulled from ASL, but the syntax follows English word order. PSE doesn't require signers to include words that carry no information, such as "am," "to," and "the." Signers will often drop prefixes or suffixes for words. PSE can be easier to learn than ASL or SEE -- signers don't have to be familiar with all the idioms in ASL, and they don't have to sign all the words necessary for SEE. PSE does not have a firmly established format -- in some regions, PSE may resemble SEE more than ASL, while in others, the reverse is true. Since you don't have to translate every English word into sign language with PSE, it's easy to speak English and sign PSE at the same time. You don't have to worry as much about your speech getting ahead of your signs as you would with SEE. Many sign-language interpreters use some form of PSE. In 1951, the World Congress of the World Federation of the Deaf proposed creating a unified sign language. In 1973, the Federation formed a committee to create a vocabulary of standardized signs. The committee called the vocabulary of over 1,500 signs "Gestuno," which is an Italian word that means "unified sign language." Today, Gestuno is known as International Sign Language, and while it uses a standardized vocabulary, there is no standardization of grammar or usage. Much like the constructed spoken language of Esperanto, ISL hasn't revolutionized international communication. The language lacks the evolutionary aspect of natural sign languages. In the next section, we'll look at some other uses for sign language. While sign language is primarily used as a means of communication with and between people who are hard of hearing or deaf, there are other uses as well. Recently, parents and teachers have used sign language as a tool to teach language skills to young, pre-verbal children. Some parents even begin teaching sign language while their children are still babies. According to the Web site Signing With Your Baby, parents can start teaching sign language to their children when they are six months old, though it may take months before the child makes her first sign. Most children can handle a dozen or more vocabulary words at first. As the child learns the significance of signs, she will often want to learn signs for everything around her. Many parents note that at some point their child's desire to be taught more signs increases dramatically. Many parents focus on teaching signs that are need-based. Their philosophy is that the child learns quickly how to communicate specific needs, reducing frustration both for the child and the parents. Common need-based signs include "more," "eat" or "drink." Parents may also teach their children signs based on what the child finds interesting. If a baby seems captivated by a teddy bear, for example, you could teach the child the sign for bear. Two obvious signs that fall in this category are "mommy" and "daddy." Some people are worried that teaching sign language to babies interferes with their ability to learn speech. Experts such as Dr. Susan W. Goodwyn of California State University and Dr. Linda P. Acredolo of the University of California have performed extensive studies to determine the effect of teaching sign language in regards to speech development. They found that children who learned sign language developed more advanced language skills and engaged in more complex social interactions than children who learned to communicate through speech alone. Experts recommend that parents speak to their children while signing so that the child understands that both the sign and the spoken words represent the same concept. To learn more about sign language and other topics, follow the links on the next page. Goodwyn, Susan W., Ph.D., et al. "Impact of Symbolic Gesturing on Early Language Development." Journal of Nonverbal Behavior. Summer 2000, 24, 2. Pg 81.